How come when you restore software — say, because you had your logic board replaced, or a hard drive fail — your registered applications frequently lose their sense that you actually paid for them, but your demo software remembers that your trial period has expired? I’m glad that St.Patrick’s is set to break ground for their rebuilding project in the aftermath of Hurricane Katrina — and I’m glad, for now, that they haven’t gotten much further. In case Gustav hits harder, and more directly, than anticipated, we’re keeping David and his family and Long Beach in our prayers. And all our other Seabury alums on the Gulf Coast, and all the good folks in peril from the sea. A recent MacInTouch reader’s comment called attention to Farhad Manjoo’s polemical tract from Slate , directed against printer manufacturers. While Manjoo frames his essay in a way that muddies the case, I share his frustration with the market model for near-commodity goods such as printers (and razors and cell phones) — where the low cost of entry for the vehicle locks the buyer into very costly proprietary consumables (ink, blades, minutes). A couple of years ago I pleaded with the LazyWeb to put together a long-life, low-maintenance printer, but so far no one has gotten on board. On the brighter side, Margaret’s home safely from her first week of work at Loyola; classes begin for her next week. Go, team! David pointed to Fantastic Contraption which is obviously a subtle plot by some terrorist organization to bring the productivity of U.S. workers to a grinding halt. The boys and I used to love The Incredible Machine (I even miss the intro theme), the game on which Fantastic Contraption is obviously modeled. Likewise, my dad and I loved Rube Goldberg cartoons (one of the Christmas presents I remember most vividly was a catalog from Goldberg’s 1970 exhibition at the Museum of History and Technology). I wish I could clear away the whole long list of tasks that need my attention, so I could devote a whole day or two to these entrancing puzzles. (By the way, the third level took me long enough that I realized I needed to quit for the day and get to my real work). Working without your computer entails predictable inconveniences, but the one that frustrates me most is the Ominous Wall of Email accumulating on servers, waiting for me to download it. I’ve successfully kept my inbox below ten items all year — now I see 47 items backed up in my inbox. Most of these I’ll be able to drag to my “Looked This Over” folder right away, but some I won’t, and I still don’t have a signal from Apple concerning the return of my notebook. If you’ve been thinking about dropping me a digital line, this might not be the best week to do it. 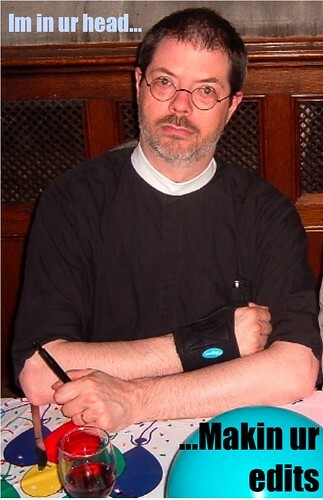 Susie Schaefer sent me an email message yesterday afternoon; it began, “I’m supposed to be writing articles on summer youth events for our diocesan newspaper. Instead, I’m erasing every other sentence.” This reminded Susie of the olden days back at Seabury’s Writing Boot Camp (Hello Debra, Beth, Cliff, Siobhán, and others! ), where I promised that if we practiced the principles I taught there, eventually we would internalize the awareness of what our colleagues would say to us about malconstructed periods, imprecise usage, and evasive passives. I glow with pride (not only that my writing instruction has taken root, but also that Susie sustained a correct implementation of LOLspeak), and I urge Susie et al. to press forward for the golden afternoon when they no longer “erase every other sentence,” but compose freely in strong, supple, limber, stirring prose. Even for a diocesan newspaper. Now, I can haz bocaburger? Today was Margaret’s first day at Loyola, which involved her leading a faculty seminar on a recent papal encyclical, and my first day of classes at Duke, which involved an introductory session with my Greek Exegesis of John class. Both of our days involved a lot of walking and, giving the climate in both Durham and Baltimore, a lot of perspiration. My class listened patiently as I sketched my vision of the fitting way to study the Greek text, and they indulged my many eccentricities; Margaret’s report suggests that the Loyola theology faculty participated actively and appreciatively in the discussion she facilitated. We’re both worn out, and both thankful for good starts. This morning I brought Margaret to RDU for her first flight to Baltimore as a member of the Loyola faculty. Although her plane was delayed, everything worked out fine, and I got back in plenty of time to take Pippa for morning services at Duke Chapel. After a brief midday break, we headed out to The Streets at Southpoint. Our main objective was to drop off my notebook computer for repairs, but Pippa had ideas of her own. When we arrived (early), Pippa spotted a couple of end-of-summer sales on the sort of light clothing she had less call to select in the frozen Northland. I, meanwhile, headed for the Apple Store to make my appointment with Technical Destiny. His off-the-cuff diagnostic involved a replacement battery, a replacement hard drive, and a replacement logic board. I proposed that they simplify life and just give me a whole new computer, but we all know that’s unlikely. No matter — with as many replacement parts as he’s likely to install, my MacBook should be as good as new toward the end of the week. I cloned my two-plus-year-old MacBook Pro’s drive on Thursday, anticipating taking it to the Duke computer repair shop (which does Apple-authorized AppleCare repairs), but it turns out that they charge $90 if you didn’t buy your computer from Duke. I made an appointment at the local Apple Store, but they didn’t have a slot till Sunday afternoon. Meanwhile, I’m trying not to change any important files, even though I use Time Machine — I don’t want to tempt digital fate. In case anyone’s Googling for similar symptoms, my battery is acting unpredictably (despite having been replaced under the MBP recall program) such that it shuts the computer down when the Battery meter suggests that I have twenty minutes or more left, I’m experiencing sporadic system crashes even when connected to AC, and (I forgot to mention this one to the Apple representative, so I’m writing it here so I’ll remember it tomorrow when I turn this one in) occasionally the display flashes a trace of magenta in the lower right corner of a window (or an embedded video element). I have two separate case numbers, one for the power problems and one for the crashes. My AppleCare runs out mid-2009, so I wanted to get these squared away at such a time that would permit me a return trip in case Apple doesn’t resolve one of the problems. At the same time, beginning the school year (my first class meets Monday) without my digital weapon of choice at hand makes me feel edgy. I’m a-hoping they spruce it up nicely at Apple, and I can swoop in for the second week of classes at full strength. 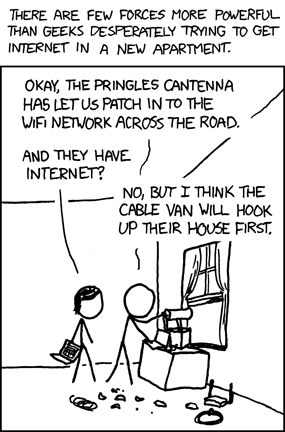 xkcd has a cartoon today that characterizes the way Margaret and I spent the days between when we left Princeton (actually, to be precise, “between when our cable service in Princeton was cancelled”) and the day before yesterday when the cable van hooked us up. My appointment to drop off the MBP is Sunday afternoon; my first class at Duke comes up on Monday. Keep an eye on me, to see how “teaching without my outboard brain” is affecting me. Well, to be exact, they want my two-year-old MacBook Pro, which has been misbehaving more and more egregiously all summer. Since we haven’t had a stable address till recently, we haven’t had a convenient way to get the laptop serviced. Where would it be sent? Or at what Apple Store might we take it in, to be picked up at another one entirely? Now, however, as classes and a series of presentation dates loom, I called Cupertino to see whether they might be able to come to the aid of my poor distressed computer. They were so impressed with my symptoms that they issued me two distinct case numbers. Now I have to back everything up, run down to Duke’s computer repair facility, clench my teeth, and get ready to go for a week without my digital right arm. The installer from Time-Warner finally came today, and after testing and rejecting one defective modem, he set up a modem that works. Now, however, we find out that our Lexmark printer doesn’t agree with being the USB printer from an AirPort Extreme. Plus, the older model of the Extreme (which we have) doesn’t allow networking USB hard drives, plus one of my (neurotically many) hard drives seems to have given up the ghost (my last Fireware drive ever, I expect). But we’re online, on our own connection. And I picked up a second-hand microwave. We’re getting closer. Oh, and I booked a flight from St Louis to Nashville on American. I can’t explain the difficulties I was having, but thanks for the ideas.